It's still #MuseumWeek. Today (3/27) is #FamilyMW, tomorrow is #FavMW, and Sunday is #PoseMW (read more in last week's post). So far this week, @PennsburyManor, @LandisValley, @FriendsofWCP, @EphrataCloister, @BushyRun, and @PHMC have been tweeting their little hearts out (me too). Find something to tweet about this weekend on the Trails of History. Thanks to Kurt Bell and Joshua Stahlman from the PA State Archives and to intern Carolyn Wasser for providing information and images for this post. In 2014, the Pennsylvania State Archives requested and received a $3,845 grant from the Tom E. Dailey Foundation to fund the MG-48 Fall Brook Coal and Railway Company Records project. The project, administered in cooperation with the Pennsylvania Heritage Foundation, began in late August and was completed last week (on March 17). The grant money supported intern Carolyn Wasser, an undergraduate history student from Kutztown University, who processed a total of 29 cartons and 489 folders of material. Carolyn completed the first four series--Col. John Magee’s Correspondence (1893-1900), the Hon. John Magee’s Correspondence (1860-1868), Fall Brook Coal Company Agents’ Correspondence (1860-1897), the Fall Brook Coal Company General Correspondence (1860-1919)--and part of the Fall Brook Coal Company Railroad Correspondence (1860-1919). Carolyn created a blog to share information about the Fall Brook Collection and her work processing the records, which included letters, memoranda, and other documentation of company operations in Tioga County, PA, and southern New York State. In the first post she introduced herself to the public: "I am a History and Library Science dual major at Kutztown University as well as a Pennsylvania German and International Studies minor. I am Vice President of Kutztown History Club and the National History Day advisor for Kutztown Area School District. I enjoy local, labor, and environmental history. I enjoy hiking, running, kayaking, and eating pumpkin flavored things." In her blog posts, Carolyn highlighted documents that drew her interest and shared additional information and research to put them in historical context--such as an 1894 letter that touches on transportation, labor disputes, and personal milestones or a letter written just after the start of the Civil War. My favorite post is the one in which she illustrates the variety of fasteners (Pins to Paperclips) that she found among the correspondence and researched. Although the internship has officially ended, Carolyn reports in a final blog post that she will be returning to the Archives to conduct additional research for papers that she is writing about her work. In addition to writing series descriptions for the records she processed (helping to preserve them and make them available to Archives researchers), she also added to her understanding of industrial and labor history and will be sharing that, she hopes, through conference presentations in addition to papers she writes as part of her coursework. Sounds like a valuable and worthwhile internship all the way around. Thanks to the Dailey Foundation, the Archives staff, and Carolyn Wasser for supporting and sharing this work. Today's guest blogger is Sean Adkins, PHMC's Information Specialist. Next week, follow @PHMC on Twitter as we highlight our collections and offer a behind-the-scenes look at exhibits during #MuseumWeek. A week-long program set to kick off Monday, March 23, #MuseumWeek is a global social media effort that partners thousands of museums with Twitter, encouraging institutions to tweet about their collections while urging the public to share their memories and experiences. Each day of the week carries a different theme designed to introduce visitors to what goes on behind the scenes at museums, large and small. Those who log on will not only unearth long-held secrets, but will also learn the stories behind the architecture of each institution. Visitors are encouraged to share photos and videos of what they like best about their museum. The themes are broken into seven hashtags including #secretsMW, #souvenirsMW, architectureMW, #inspirationMW, #familyMW, #favMW and #poseMW. Start the week by going to @PHMC on Twitter. 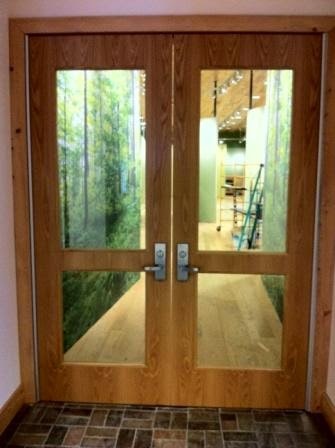 Look for tweets leading to behind-the-scenes videos that explain how exhibits go from ideas to fleshed-out displays. Watch as volunteers learn how to educate visitors with the help of a recently fabricated period cart. Catch a clip of renovation experts revamping the dioramas inside The State Museum's Mammal Hall. On Wednesday, tour The State Museum with PHMC's architectural supervisor and discover the secrets of Midcentury Modern design. Finish off the week with our five CAP curators as they pose with William Penn. And don't forget to look for #MuseumWeek tweets from or share your memories of other sites along the Pennsylvania Trails of History. Pennsbury Manor (@PennsburyManor) and Landis Valley (@LandisValley) have signed up, but many others are on Twitter. UPDATE: Washington Crossing Historic Park (@FriendsofWCP) has now registered. We have a lot planned for #MuseumWeek, but what we want most is to hear from you. What secrets of the museum would you like us to reveal? Share your favorite museum memories and allow us to retweet your experiences. Leave a comment on the PA Trails of History Facebook page telling us what you'd like to discover about Pennsylvania's history. Fifty years ago The State Museum and Archives Complex opened in Harrisburg. 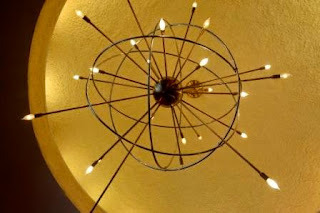 A hallmark of Midcentury Modern architecture, it was a dramatic contrast to traditional designs and settings that typically housed historic collections. Interest in the building’s design has ebbed and flowed, but as is often the case, perspective is gained over several decades, and classic, iconic styles come back into vogue. Have you noticed that commercials and ads now often feature an updated '50s or '60s ranch house as the perfect home setting instead of the earlier Craftsman style we saw so much of in the last decade or so? Are you a fan of the TV series Mad Men? 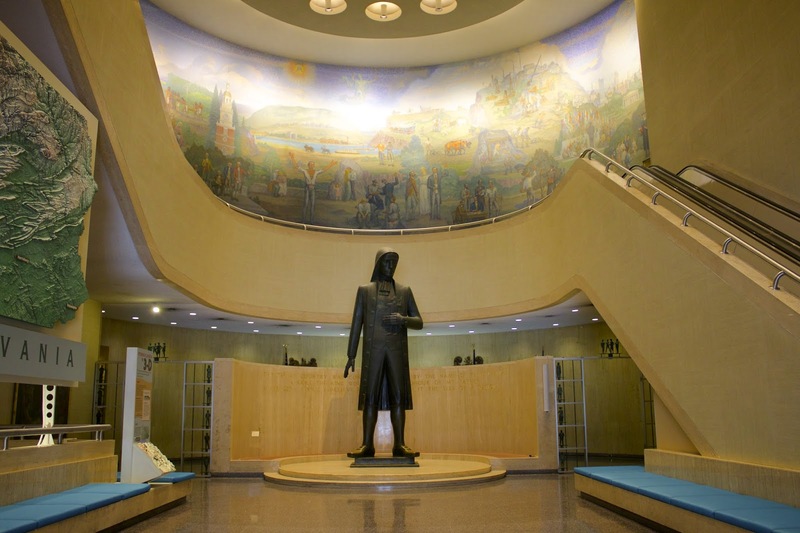 If you know the show, it would not be a surprise if you saw lead character Don Draper checking out the William Penn statue in Memorial Hall, The State Museum’s colossal Midcentury masterpiece! The return of '60s motifs to popular culture happily coincides with the 2014 listing of The State Museum and Archives Complex to the National Register of Historic Places and the complex’s 50 year milestone. PHMC is hosting a number of special events throughout the year to mark this anniversary. One program to note is an invitation to submit photographs to a juried photo exhibit featuring Midcentury Modern architecture (1930-80) in Pennsylvania, now through June 30, 2015. Photos will then be selected by a stellar panel of jurors – Dennis Hockman, Editor of Preservation Magazine, National Trust for Historic Preservation; photojournalist and Midcentury Modern specialist Betsy Manning of Philadelphia; and David Oresick, Executive Director, Pittsburgh’s Silver Eye Center for Photography. The resulting show will be on display at The State Museum October 25, 2015, through February 28, 2016. What will we be looking for? Creative shots of hidden and not-so hidden exterior and interior shots of Midcentury architecture from throughout the Commonwealth by photographers of any level of expertise, enthusiast to professional. There will be a “best of show” purchase prize offered, as well as a “best of The State Museum and Archives Complex” purchase prize. Between now and June 30, photographers who pay general admission and sign up at The State Museum’s front desk may bring tripods into the museum during their visit. And for some special access, I will be leading a tour of the museum for photographers on Sunday, April 26, from 1-3 pm (contact me at bhager@pa.gov to sign up for the tour in advance – spaces are limited). We’ll be going up to the rarely seen 5th-floor administrative offices where we’ve just restored the lobby to its Midcentury Modern best and refurbished the furniture originally purchased in 1964. Don Draper would be proud. 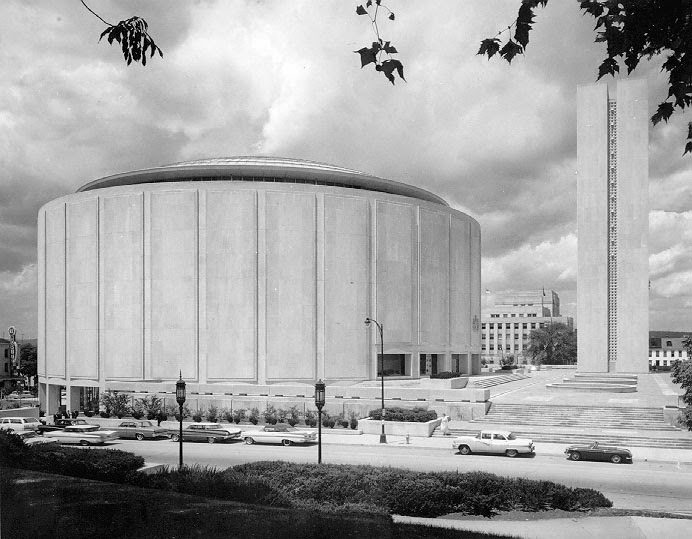 For more guidance on spotting Midcentury Modern architecture in Pennsylvania, visit exhibit juror Betsy Manning’s photography exhibit, “UnCommon Modern,” which showcases great examples and features of this period, on view through April 26 at The State Museum. Find the official rules for the juried photo exhibit at The State Museum’s web site. Watch for special programs throughout the year, including an exciting black tie gala hosted by the Pennsylvania Heritage Foundation on October 24, 2015, almost 50 years to the day of the complex’s original dedication. 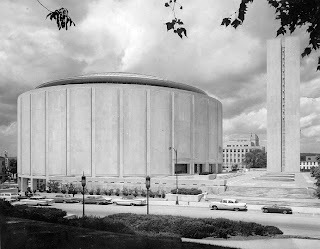 Join us for fun and new insights into our Midcentury Modern roots at The State Museum and Archives Complex in 2015! Well, it's March and this week still felt like winter with a vengeance. Luckily, the forecast for the weekend is a bit brighter, or at least warmer. Charter Day is Sunday (March 8), and we will be celebrating Pennsylvania's birthday by offering free admission on the PA Trails of History. Not all sites are open for the season, however, so please be sure to check the list to make sure the site you want to visit will be open. (Please note that Eckley Miners' Village has had to close due to a broken water main; they were listed in an earlier post and press release as being open.) Last week's post had the March program listings, so you can check that for more info on site activities on Charter Day and beyond (I've added some updates and links since last week). 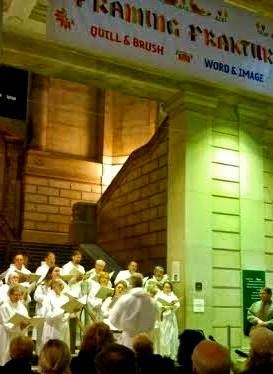 The Ephrata Cloister Chorus performed Monday night at the Free Library of Philadelphia as part of the opening ceremony for "Framing Fraktur," a multi-institution effort that includes a conference and several exhibits featuring historic fraktur and contemporary art. The conference, "Everyday Lives of Germans in Pennsylvania and the Atlantic World, 1683-1850," continues this weekend under the auspices of the McNeil Center for Early American Studies. The exhibitions will continue into the summer. Ephrata Cloister has participated in this major project through the loan of fraktur as well as scholarly papers (and the Chorus performance). While we're on the subject of history (we do get to talk about history sometimes), Old Economy Village was featured in two recent articles exploring the economic history of western Pennsylvania, specifically Beaver County. One article looked at religious groups in general and mentions Old Economy. The other explored the significant role of the Harmony Society's activities in driving the regional economy. And speaking of history and economics (I'm on a roll, now! ), Drake Well Museum and curator Sue Beates were part of a recent NPR story about pipelines that looked at the early oil industry of northwestern Pennsylvania. Sue talked about Pithole, our favorite oil boom town, and the network of oil pipelines found there and the surrounding area. You can listen to it here or read a transcript. Don't forget to turn your clocks ahead this Sunday (or Saturday night) or bad things will happen. That punk-su-tawney Phil will see his shadow and we'll have 10 more weeks of winter. Or something like that.